Photo provided by Stanislaw Warwas. The Archaeological Site of Philippi comprises the ruins of a Macedon city, that saw its heyday in Roman and Early Christian times. Philippi was founded in 356 BCE by King Phillip II (and named after himself), on a strategic location on the east-west route through his empire which was later reconstructed by the Romans as the Via Egnatia. The city later became a center of Christian faith and place of pilgrimage, because according to the New Testament it had been visited by the Apostle Paul around 49 or 50 A.D. 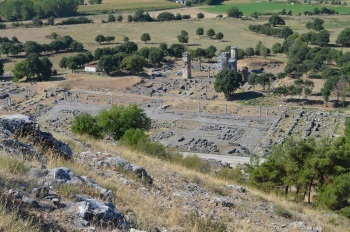 The first church in Philippi was established in the year 343. Philippi – now part of Eastern mainland Greece - developed into a strategic provincial town under Roman rule and became an early centre of Christianity. Although its remains are not up to par with the great Ancient Greek sites such as Olympia or Delphi, I found it interesting enough. With its Roman and Christian roots it has a completely different background story than the other pure Greek WHS. I walked around the archaeological site at ease for more than 2 hours. It is a large area that consists of different sectors. The path from the eastern entrance first passes the theatre. This originally Greek theatre was transformed by the Romans into an arena for animal fights. Their descendants, the early Christians, wanted to have nothing to do with that. They put it out of use and let it perish. Nowadays it is again a recognizable theatre with rows of seats, where a theatre and music festival is held annually. Interesting reliefs and sculptures still adorn the outside of its walls. Central to the site is an open square, the former Roman forum. Just like in the rest of Philippi there is not much of it left: the city was destroyed by an earthquake in 619, but it looks like it happened last week. All stones that have fallen are still lying on the ground. Only the contours of such structures as a row of shops can still be seen. At the edge of the archaeological site there are two structures which are worth a look: the Octagon, an early Christian church with reasonably well-preserved mosaics. And the remains of a section of the Via Egnatia , a road built by the Romans in the 2nd century BC. The location on this road has brought Philippi many traders and pilgrims in Antiquity. Biblical tours through this region also like to stop at Philippi. In the year 49 or 50, the apostle Paul is said to have christened the first European close to here – it was a local woman named Lydia. On his second missionary visit, he ran into a slave owner when he healed a slave from the evil eye and as a consequence she could no longer work as a fortune teller. So he was thrown in jail. A miracle follows “They and the other prisoners, however, are soon freed due to a miracle. An earthquake occurs that causes Paul's cell door to open and his bonds to loosen up. This not only happens to him but to ALL those within the prison.” This prison cell is, according to reports or belief, still preserved and can be seen at the archaeological site. A few practical notes to conclude: I left my (recommended) overnight stop of Kavala for Krinides (the modern town where these excavations are located) at 9 am. Buses seem to run every hour on the hour, also on Sundays. The return bus from Krinides leaves a bit past the half hour. 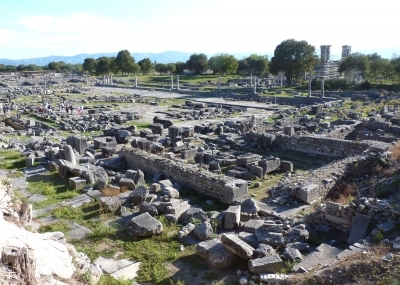 At the Philippi Archaeological Site, I was the first visitor of the day and they did not have change from 20 EUR yet to pay for the 6 EUR entry fee – but fortunately they did have a credit card machine. When I finished my tour of the site I found the café-restaurant that lies next to it totally overrun with what seemed to be local visitors. Oct 2017 - Another day in Greece….. another “Greek” ruin….! Well not really - ok Philippi is in Greece and was named by Philip II of Macedon in 356BC when he captured it for its nearby gold mines and strategic position, but this is no Delphi or Delos. There are some remains of “Greek” civilisation - but what you are going to see is primarily a late Roman colony planned as “Colonia Victrix Philippensium”. This occurred as “late” as 30BC following the Battle of Philippi 10 years earlier, and the city then developed into an early centre of Christianity - particularly from the 4th C, until it withered in the late 6th C.
Greece has only added 2 sites to its inscribed list in the 21st Century - Corfu in 2007 and Philippi in 2016. One can understand perhaps a certain reluctance to put forward yet more archaeological sites from classical “Greek” civilisation and the “Roman” and “early Christian” ruins of Philippi do “fill in” another period across the long “continuum” of Greek history. But I do wish they would get round to Knossos and Akrotiri!! My main memory of Philippi is of a vast area of stone blocks hardly rising above ground level, which form the layout of the Roman City (Photo). Scattered around are a few taller pillars and walls, but the site lacks any really significant “sight” whether artistic or architectural. The, originally “Greek”, theatre is not particularly noteworthy among many such remaining structures. It was altered by the Romans to accommodate better their love of animal/gladiator conflicts (ie removal of the front rows to create a wall to keep those lions at bay and the introduction of an entry tunnel for them!) and is now used for a modern “Festival”. The city is set out around the Forum, alongside which runs the famed “Via Ignatia” whose visible paving still shows the cartwheel lines of wear. Some, otherwise insignificant, walls create a partially roofed “room” where it is said that St Paul was held prisoner (c57AD). The site majors significantly on its Pauline “connections”, not unreasonably perhaps, since both he personally, and his memory, contributed to the city’s development as a centre of early Christianity. There are the (mainly minimal) remains of no less than 3 Basilicas (unimaginatively titled Basilicas “A”, “B” and “C”! ), an octagonal church and a “Bishops House” but none would seem to offer much of note to the non specialist. The first Christian church building in the City (indeed possibly in Europe??) predated the “on view” remains of the Octagonal church which was built over its location. The remains of a Roman villa with a few mosaics and the inevitable “Roman latrines” complete my inventory. Behind the ruins, lies a bare rocky hill which constituted the acropolis of the original Macedonian city – but the description didn’t indicate that there was much to see up there and we didn’t climb it. Outside the inscribed area lies the modern Baptistry of St Lydia, erected next to the stream where, tradition holds, St Paul baptised the first documented (Acts 16 14-15) convert to Christianity in Europe. 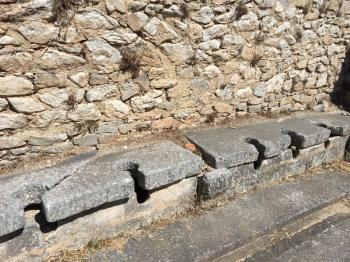 It seems to be an “obligatory” stop for many visitors to Philippi, demonstrating again the “Pauline” attraction of the site, and its garden is set out for services and outdoor baptisms in the very stream……. The Western end of the site is entered along a “gated” tarmac road with its central white lines still clearly visible but now closed to traffic and forming the prime walkway through the site. It appears that this was, until fairly recently, the main road between the towns of Kavala and Drama. This “original” route, cutting the ruins of Philippi in two, is clearly visible on Google Satellite view, together with its realigned new by-pass to the South and West - all part of Greece’s preparation for Philippi’s nomination since ICOMOS would have been very unlikely to have liked a highway passing right through the site! But there were further problems to overcome – the Nomination file (still) contains significant passages about the Battle of Philippi, whose battlefield site was to be an element of the nomination but was willingly “dropped” by Greece in order to keep ICOMOS happy. We didn’t bother to try to track it down. And that’s about it. I found that this WHS needed a lot of faith and/or imagination to breath life into its dead stones. I lack the former (though others following the footsteps of St Paul found this aspect uplifting) and wasn’t particularly able to summon up the latter compared with the numerous other Roman cities around the Med we have visited. Philippi has a spot in the history books for two reasons. First, it was on the fields of Philippi that the Roman Republic ended when the final battle was lost to forces of Octavian and Markus Antonius. Then, it’s listed in the bible as the place Christianity came to Europe. 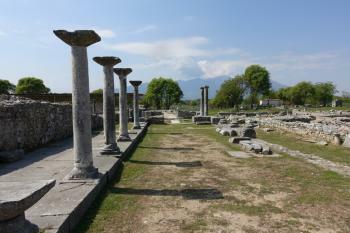 Both events show in the ruins of Philippi. The city was remodelled by Octavian. And several early Christian churches were built here. Both have left there mark in the ruins you will get to see. I spend roughly 1.5h on site which includes a nice museum. And while these ruins are great, Greece already has many sites listed from the period. I do wonder how many more Greek ruins should be inscribed? Coming in from Thessaloniki I followed Stanislaw’s description and it worked to a point. There are regular busses (normal, express) running more or less hourly from the main bus station in Thessaloniki to Kavala (2-2.5h). As far as I could tell the first bus runs at 8 a.m.
From Kavala jump on any bus to Drama and get off at Krinides. Important: There is also a town named Philippi, but the archeological site is in Krinides. From Philippi you could connect eastwards towards Turkey. As much as I want to see the Hagia Sophia, given the current political situation I did not invest any time in researching this option. Another interesting option is going North to Banska for Pirin National Park. There is one mini bus each day at 4 p.m. from Kavala Bus Station via Drama. I found this one at rome2rio.com and confirmed it here with a little help from google translate. The bus also goes the other way. Tickets are bought at the Kavala bus station. If you are continuing onwards you can leave the luggage at the post office at the bus station. Just ask them. It’s not really a locker, more a place where they hopefully watch for your luggage and you tip them for it. Again, following Stanislaw’s comments: You should spend some time in the old town of Kavala. It’s fairly nice with an aqueduct, an acropolis and views of Thassos. It’s also a nice distraction from the concrete jungle that is Thessaloniki. While I don’t feel it must be Kavala, I do feel a nice Ottoman city would be a good addition to the Greek list. It is possible to visit Philippi as a day trip from Thessaloniki, although you should start very early in the morning. Take the first bus to Kavala from KTEL Makedonia bus station at 6 am (around 2h20min) and change there for a local bus going towards Drama, get out in Philippi (20 min, lots of buses), very close to the entrance to the site. The entry fee to the site and the museum is 6 €. You will get a leaflet with the plan of site and potential paths to follow. No guide or guide books in English available. The site itself is not very enormous and comprises 3 parts. Acropolis situated above the archaeological remains contains mostly medieval walls and is not very spectacular, but the views from there are really nice: you get the panorama of the Roman and Christian sites and the battlefield from 42 BC. To get there involves a steep 30-minute hiking through the bushes – the path is not easy to find, it stars just behind the fence very close to the museum. The other parts of the property are divided by a road that used to be part of Roman Via Egnatia. The upper part of the old walled city comprises Greek/Roman theatre, remains of some temple and footings of an old basilica, called Basilica A. Every year in August there is a Theatre Festival held at the site. Although the city was founded by Philip II of Macedonia, because of the silver mines in this area, it reached its peak during Roman times. And the visit of the apostle Paul in the ’40 of the first century made it a very important pilgrimage site too, but only for a short period. The hole in which St. Paul was imprisoned is located in the SW side of the basilica. (I was told that there were some painting on the wall of the hole but I have not seen them.) Then you can go to the small but interesting museum, passing by Basilica C, not accessible for tourists. The museum has 4 galleries: Prehistoric period, Hellenistic city, Roman colony, Early Christian and Byzantine. All artefacts were found in Philippi, the most interesting are stone and marble stelae and glass products. In the lower city there are remains of agora, octagonal building with some mosaics in situ and the biggest basilica (called B or Direkler). Behind the basilica there are 50 public toilets which seem to be one of the most interesting part of the site. I spent around 4 hours at this WHS, including climbing the acropolis, but I am sure that everything can be “done” in just one hour and a half. You return to Thessaloniki the same way by bus, but if you still have time, spend some time in Kavala, in its old ottoman upper city, walk along the shore or the aqueduct and have a lunch in one of the restaurant serving wonderful sea food. Part of Cultural nomination rejected: The 2014 T List entry for Philippi included the Battlefield and "The rock art in the Lekani foothills, approximately two kilometres east of the city of Krenides, depicting human and animal figures and the distinctive horseman.... The important mines in the area east of Philippi and northeast of the ancient port of Neapoli (modern-day Kavala), identified with those referred to by Herodotus and Thucydides as Skapte Hyle." The latter 2 elements didn't appear in the Nomination file but the Battlefield did as a "second component". ICOMOS didn't find "authenticity" and Greece removed it.